Brilliant card Sylvie, I like the colours you have used, Roy will love it. 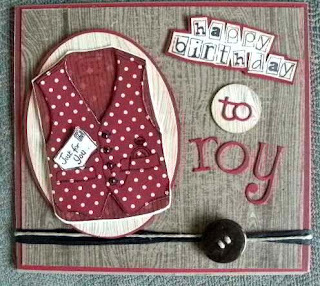 Hi Sylvie, Roys card is fabulous, he will love it. a few days in spain sounds great, is there room in your case for a big one? I might think about getting Dave's card out again this year great idea, he wont have a clue! A great guy card, you've done a fab job. Fabulous man card. I love the waistcoat and the layout. Great card. This is just perfecT .Love the wasitcoat!! Fabulous man's card Sylvie. Sorry to miss it when you posted it - I'm trying to catch up at the minute. Love that waistcoat.